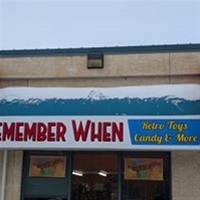 Our nostalgia toy store offers a unique selection of toys for children and 'those young at heart'. We are focused on bringing back the retro toys that we grew up with . The toys in stock are in a variety of material from the old tin toys and hand made wooden toys. Some toys are handcrafted in Southern Alberta. We have built wood toys and gone to Christmas markets for 20+ years and have found a need for the old style toys year round. The store is here to return young and young at heart to get back to the simpler way of play with less focus on the tech gadgets and provide toys and candy made from the heart by the hands of quality craftsmen & artisans are much needed in a world full of grandiose living. As you walk thru the store you find Canadian product. We promote local Southern Alberta and Saskatchewan crafters, Canadian authors, Brittle made in Strathmore that is gluten and egg free and fudge, popcorn and cotton candy from the Chocolate Moose Factory. We have loose tea out of Calgary. We have brought back Pic A Pop and the old classic Nutty Club candy that was in our grandmother’s candy dish growing up. Come see us and do some reminiscing while shopping locally.